I have been walking around my neighbourhood, the streets of Coburg, looking at the street art, the public art and the streets. You can see almost 150 years of history of domestic architecture on the streets of Coburg, from the 1870s to the contemporary buildings still under construction. And you have to love quality pop culture home modifications; we need more of this kind of Batman, not the John Batman kind. Notable Melbourne street artist, Al Stark Thinking of the Earth has painted a mural on a couple of buildings at Coburg Oval. Regardless of what I have recently written about murals I like this one. The abstracted geometric shapes and the colours glow against the dark ground improving the feel of an otherwise drek utilitarian carpark between the Sydney Road shopping strip and the oval. On the wall of the new flats by the Reynard Street railway crossing is Tropical Flora. 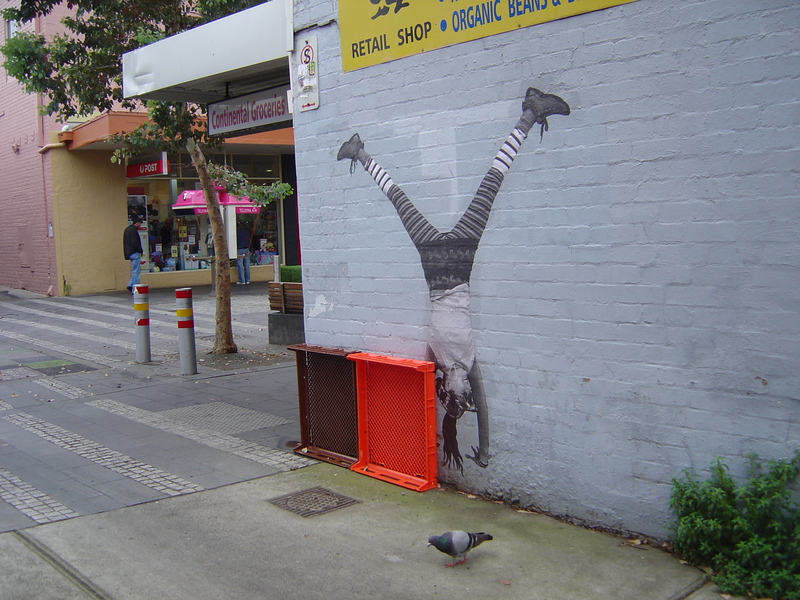 It is a mural by experienced Melbourne stencil artist 23rd Key. The very large multi-layered stencil of hibiscus flowers and monstera leaves are technically proficient but boring. There is also more unauthorised street art around. I love finding little pieces hidden away, making a treasure hunt out of a walk around the neighbourhood. But this is the strangest piece of buffing; it leaves you wondering what either the writer or the buffer was thinking. Some great guerrilla gardening taking over a wide nature strip in Coburg complete with a mosaic ceramic features by local Mel Craven. The sculpture of a small bronze house on a rusty steel plinth has been removed late 2016 early 2017 from the corner of Victoria Street and Waterfield Road. Dwelling by Jason Waterhouse was the winner of the 2005 Moreland Sculpture Show. I don’t know what has happened to this sculpture; I hope that a better location has been found for it. It was too small to make any impression on the corner location. You can also see how bad Coburg’s pigeon problem was just a few years ago. What I did on my summer holiday. Did you ever write that for school? I went for a holiday in Sydney. I wanted to have a holiday and get away from my work but when your work involves public art, even walking around the block can involve looking at a sculpture or street art. I did take a few photographs of some sculptures in Sydney. I saw sculptures that I like; I loved the golden tree in Chinatown, Golden Water Mouth by Lin Li. I saw some sculpture that horrified me like the bronze sculpture of Governor Macquarie with its very large feet. I can’t help explaining the differences between lost wax and sand casting when looking at the Robert Kippel sculpture at Circular Key. The Jason Wing alleyway in Chinatown brought back memories of seeing an exhibition by him in 2009. My wife asked me if I was thinking of writing a book about Sydney’s public sculpture, after my Sculptures of Melbourne. People keep telling me that Melbourne is somehow special in its relationship to public sculpture and I just don’t buy that intercity rivalry. Admittedly Sydney did not have the year long “Yellow Peril” stupidity but it was just a stupid overblown Melbourne City Council dispute after all and not the end of civilisation. Sydney was less in need of landmark sculptures having both major architectural and physical landmarks. I ran into the sculptor, Lis Johnson in the Art Gallery of NSW shop who was up in Sydney studying marble carving. She thought that Sydney was becoming more like Melbourne with the street art in the laneways along with small coffeeshops and bars. There are a lot more public sculptures in Sydney these days. There is a similar historical trajectory as I trace in my book. And I have done the research on some of the sculptors like Akio Makigawa already. 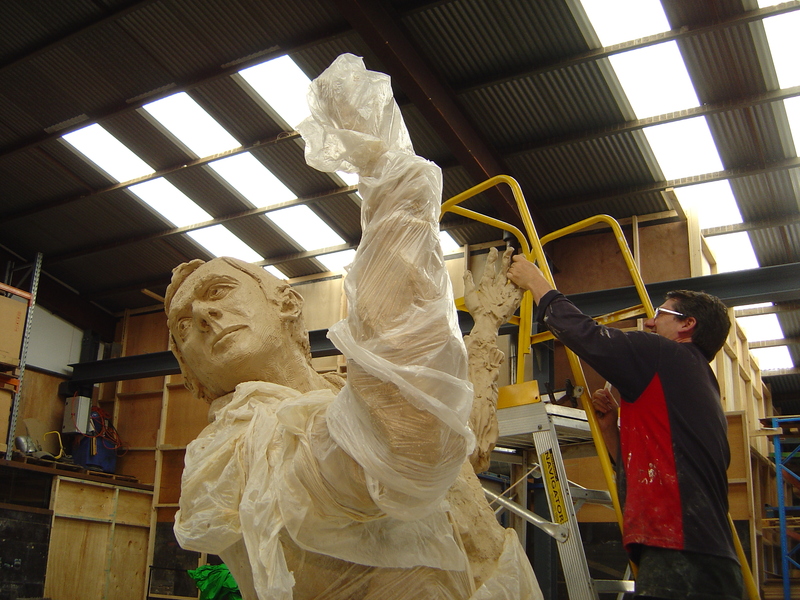 The street sculptor, Will Coles lives and works in Sydney; I could add interview with him instead of the one with Junky Projects. Pipe dreams aside I have no immediate plans to write the companion book to my Sculptures of Melbourne because I don’t live in Sydney. About half of what I have earned from writing the book has come from walking tours and talks. Anyway the City of Sydney has a good website about its public art with walking tours. 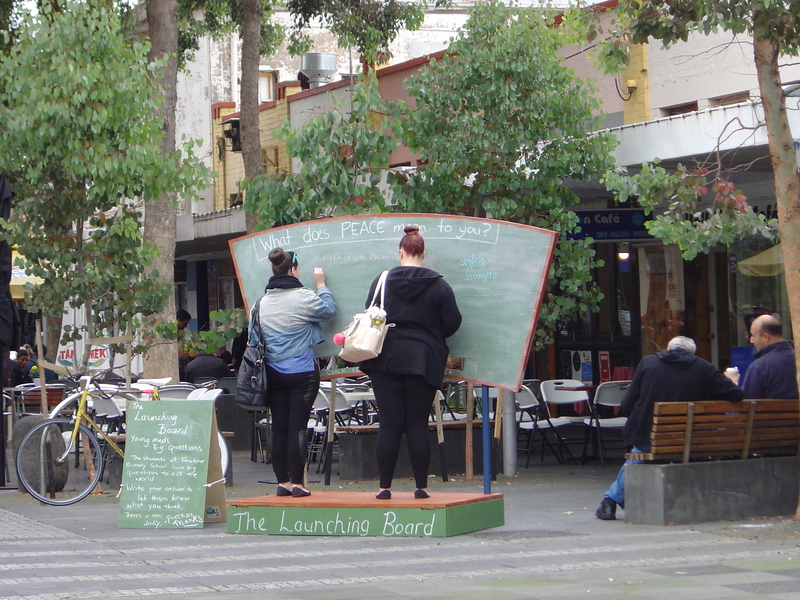 At one end of the Coburg mall, strung between two trees there was the banner announcing Ben Landau’s Coburg Quest, at the other end stood Dan Goronszy’s large chalk board, The Launching Board on its platform. In between them, the usual crowd of activity in the Coburg mall: tables of people drinking coffee and eating, small children playing and a woman busker singing folk songs with a strong vibrato voice. Some people in the mall also noticed the paste-ups by Larissa McFarlane, A Ritual of Handstands in the walls running off the mall. 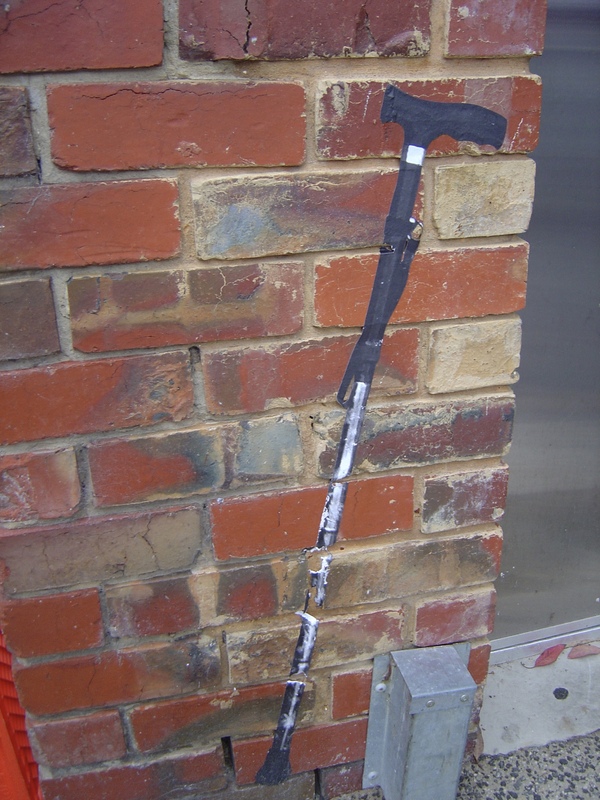 The paste-up of the walking stick leaning against the wall was particularly popular. An elderly Greek man gestures at it, “Somebody leave this behind?” he says and laughs. Coburg Mall and the laneways around Coburg are generally too far north for the street artists and these paste-ups are also part of MoreArt program for 2015. The MoreArt program is Moreland City Council’s annual public art show. This year there is a theme “Participation: Real or imagined, conjured and or discovered, a shrine, a monument, a ritual, a tribute, a custom”. There may have been themes in the previous six years but never has it been so clear in the art. The theme makes it clear that this is show is not simply art in public space, nor art for public spaces but that the public actively engages and participates in creating. This opens the program to multidisciplinary artists like Dan Goronszy and Ben Landau. 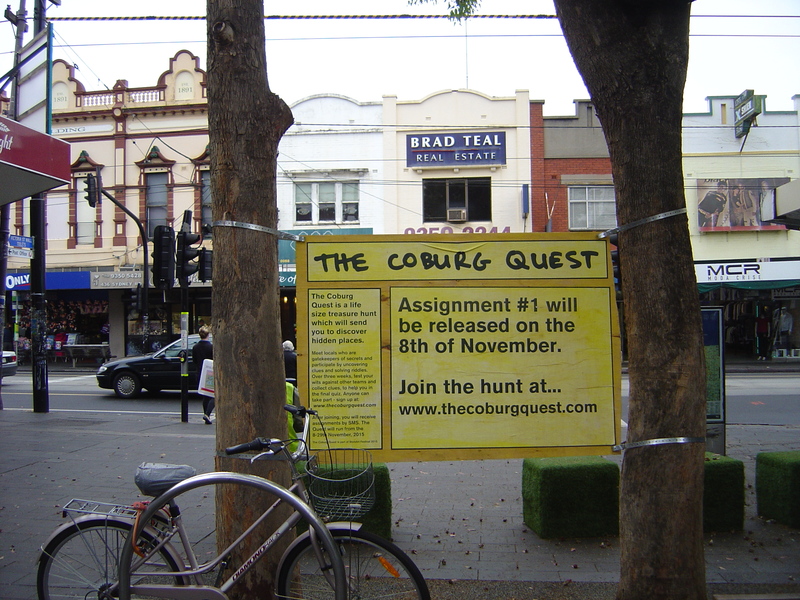 Ben Landau’s Coburg Quest required more time and participation than I was willing to devote, with multiple individual tasks and two Sunday afternoons involved in this art/quiz/game. Dan Goronszy’s large chalk board, The Launching Board had the question “What does peace mean to you?” on both sides of the double sided blackboard. Containers for chalk are built into the blackboard. Most people who stopped to look just read the few responses but every now and then someone would write something. A group of men on bicycles arrive in the mall, they stand around and watch as one of them writes: “Stop bombing the **** out of Syria” on the blackboard. I am involved in MoreArt this year. I am part of a panel discussion on public art along with Geoff Hogg, Louise Lavarack, Dean Sunshine, Laura Phillips and Aiofe Kealy: Making it in Moreland. At Fundêre Foundry in Sunshine John Kelly, the artist famous for his Cow Up a Tree sculpture, is making the third sculpture in his cow series. This one will be a 5.5 metre bronze, Man lifting cow, but at the moment it is mostly clay. 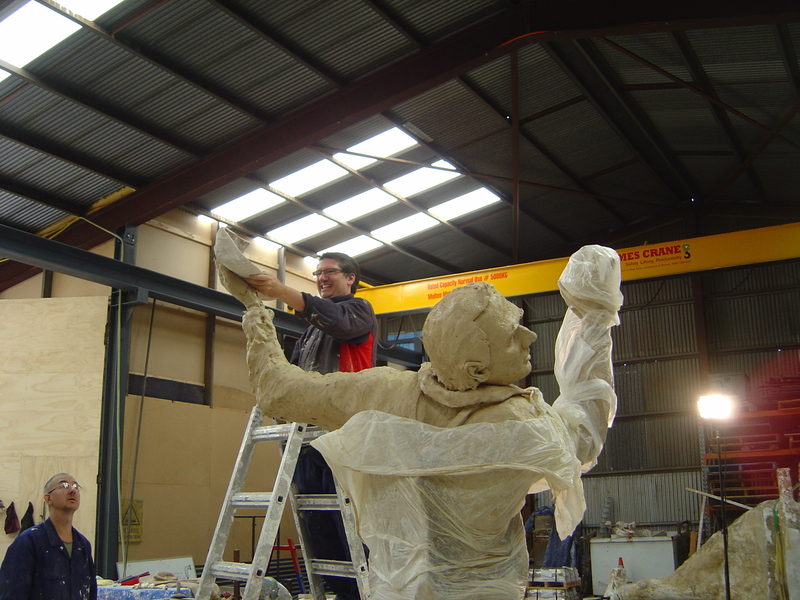 Now that I am the author of Sculptures of Melbourne, a history of Melbourne’s public sculpture I get invited to foundries to meet artists. I should really check exactly what I have written about them in the book and on my blog before meeting them, so that I can be prepared. The first thing that John Kelly wanted to talk about was site specific sculptures as I had described his Cow Up a Tree sculpture as “completely non-site specific”. I doubt that I will say anything like that for his next sculpture as there is a big hook for that story: local boy makes a sculpture for his local suburb in a local foundry. John Kelly is not the only contemporary artist who grew up in Sunshine, but sculptures by Leigh Bowery or Stelarc might be too extreme and confronting for general public. The local Brimbank City Council is making the most of the sculpture’s local manufacture, holding a “commissioning launch” at the foundry for the sculpture in a few weeks time. 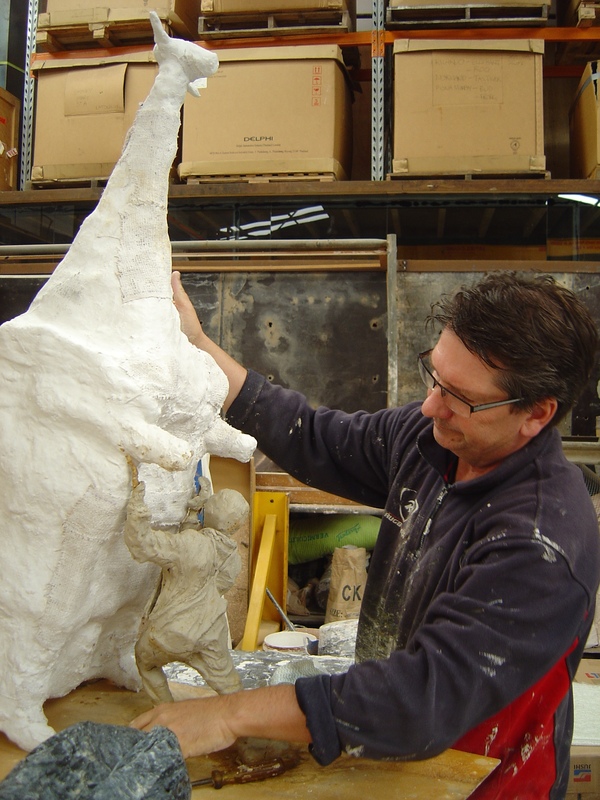 Something to do before the model becomes unrecognisable in plaster moulds. For several reasons the model for fake camouflage cow will be made of fibreglass, chiefly as it would weigh several tons if made of solid clay like the figure of man. John takes a break from pushing clay around on the sculpture and shows me the marquettes as Cameron McIndoe of Fundêre Foundry welds the armature of the hand. The problem of fitting the hand to the cow’s leg is going to take some time. 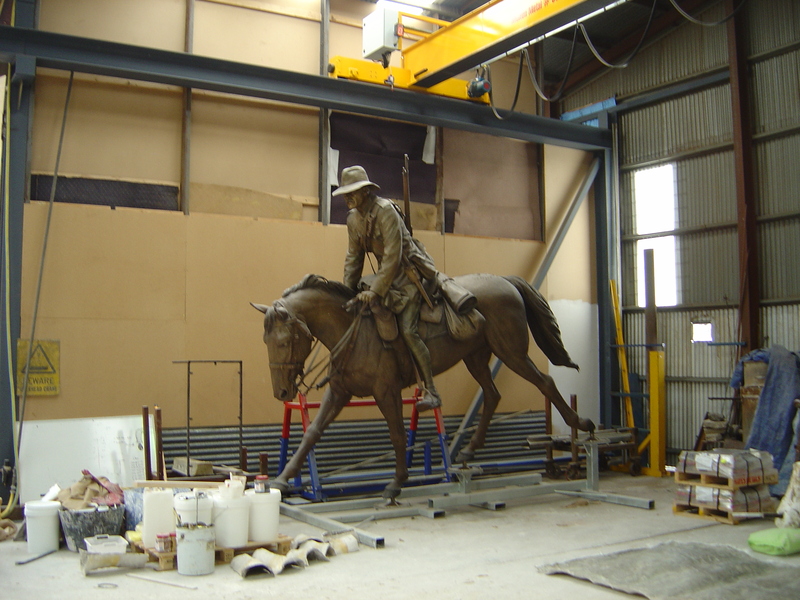 In the corner of Fundêre Foundry there is the larger than life size equestrian sculpture of a Australian horseman from the Boer War by Louis Laumen. There are plans for three more. 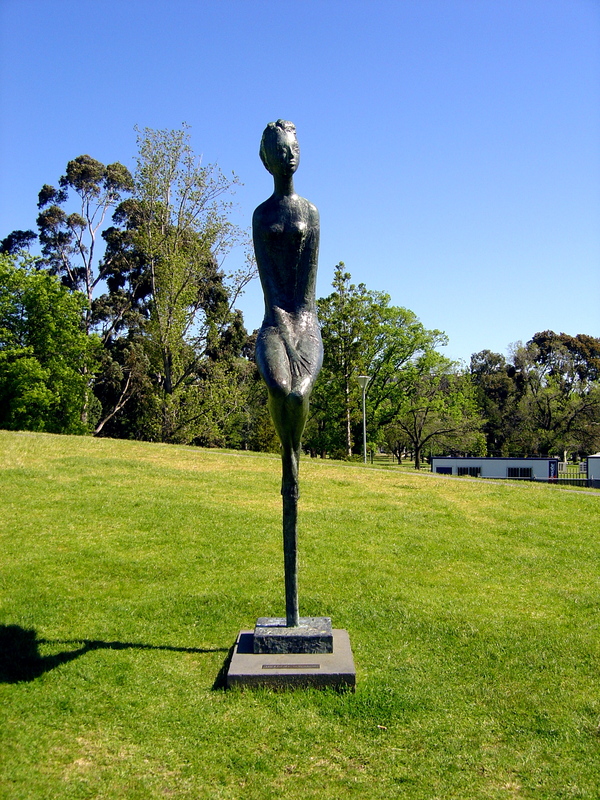 The very slim bronze figure of a woman, Miraggio (aka Seated Figure) sits perched on her tall stool watching at the Sidney Myer Music Bowl. She sits there her hands folded in her lap, listening in quiet contemplation regardless off whether anyone is performing. The sculpture was Pino Conte, (1915 – 1997 ) an Italian sculptor whose work continues to sell at auction. 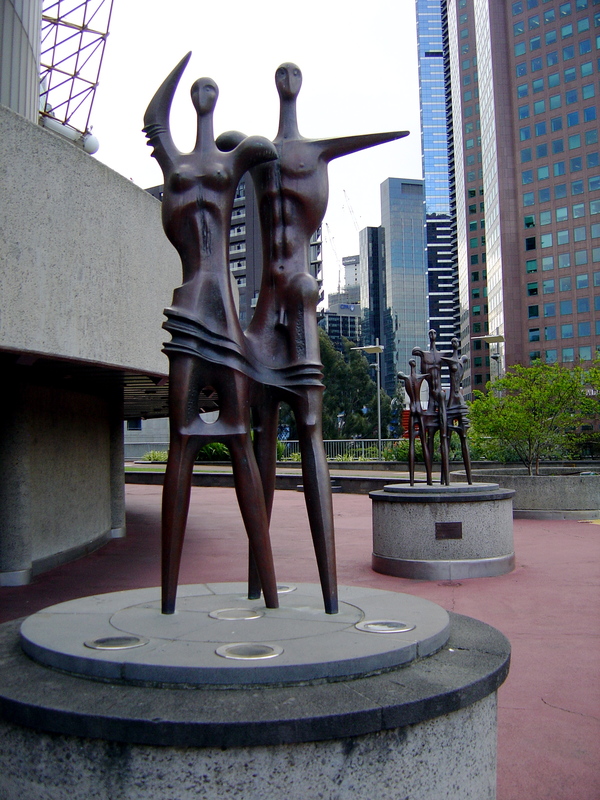 The date of the sculpture is uncertain as Miraggio came into the city’s public art collection in 1964 when an anonymous ‘Lover of Italy’, possibly Claudio and Lesley Alcorso, donated it to the Sidney Myer Music Bowl Trust and Melbourne City Council. I believe that it was Claudio and Lesley Alcorso for in December 1963, when Conte came to Melbourne to unveil the sculpture, standing next to him at the unveiling were Claudio and Lesley Alcorso. Following the re-landscaping of the Music Bowl, Miraggio was reinstalled in October 2001, in the upper grass audience areas at the Music Bowl. Maybe I should have had a section on gift sculptures in my book, Sculptures of Melbourne, especially international gifts, see my earlier post. However my book was never intended to be a catalogue of Melbourne’s sculpture; Melbourne City Council itself has 100 sculptures and 80 monuments. But maybe not, I didn’t mention many gift sculptures in the history of public sculpture because gifts, especially the international ones, are generally interventions outside of the history, with all the relevance that birthday presents have to biographies. I could have included Cole Sopov Family of Man I and II, 1984, at the Arts Centre. The modernist figures in two family groups are abstracted and reduced to the point of starving refugees. The ribbon bands joining the figures is water not drapery, they are wading ashore in new land; looking to the future, armless and naked. This is how modern art came to Australia, in the minds of post-war European refugees and migrants. Unusually this pair of sculptures are made of brass not bronze possibly because they were originally intended to be displayed in the foyer. In 1983-84 Sopov were commissioned by John Truscott, the designer of the interior of the Arts Centre for the entrance foyer and moved outside in 2001. The sculptures were a gift of John and Agita Haddard. John Haddard AO is Emeritus Chair of the Board of Governors of the Arts Centre Melbourne Foundation and currently Chairman of the Melbourne Food and Wine Festival. Greek-born Sopov arrived Australia 1971 where studied at RMIT 1973 to 1974 before going on to lecturer in Fine Arts at Chisholm college. In 1984 he was the Head of Chisholm Sculpture department (later Monash University) from 1977 to 1995. … What is going on in the parking lot and Victoria Mall? It is also included in the Melbourne Fringe Festival (not a curated festival) to market to the hipsters. 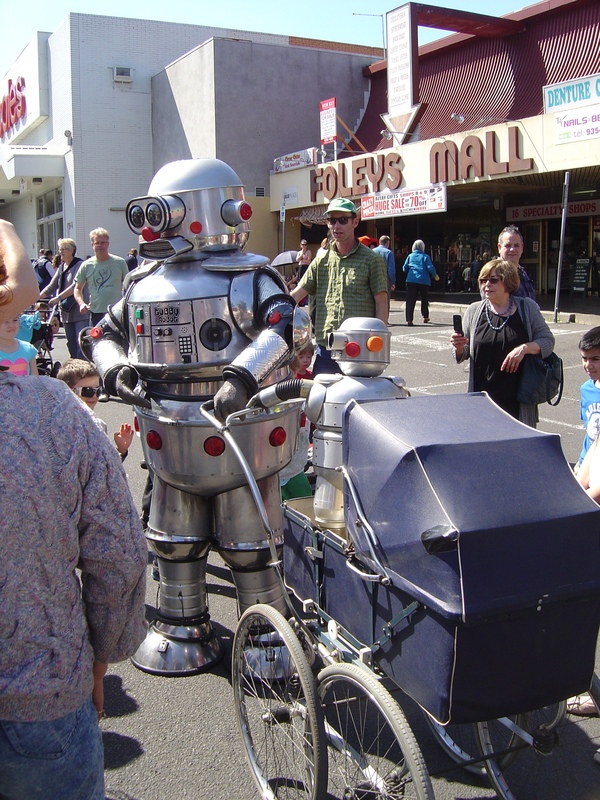 The Coburg Carnivale is definitely curated, it has a community, arty vibe to it and none of that carny festival feel. I suppose that the Coburg Shopping Precinct didn’t want anyone honing in on their trade. … There is some art work around; public seating, like Callan Morgon’s Switchback deserves serious consideration as social sculpture. 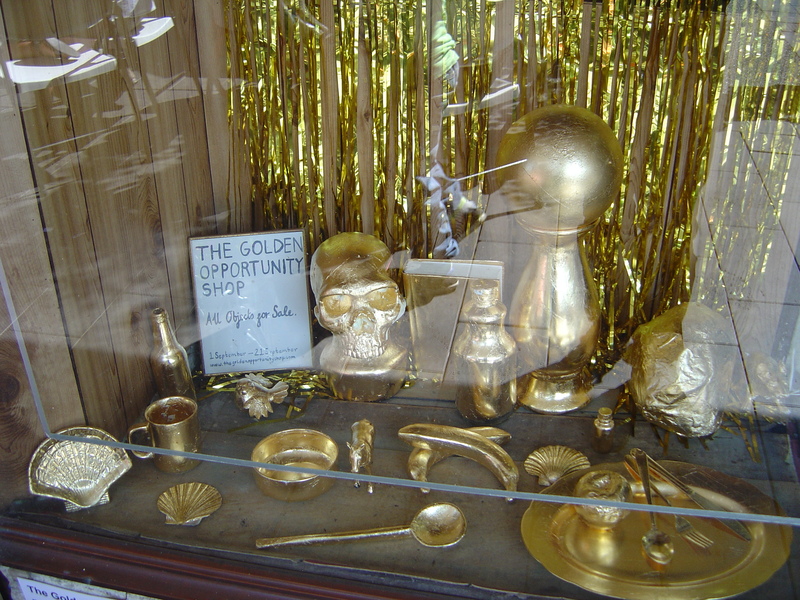 More gold is being applied by Alica Bryson-Haynes and Ria Green, see my earlier post about it. … What time is it? …. Okay if this is Coburg, then why are there so many South Americans around?